Six months ago the days seemed to drag. Whining was at its peak in our home. We had a sweet boy that despite numerous toys, spent his days with his bedroom floor covered in toys, yet never really playing with anything. He spent much of his time in front of the TV watching one show for ten minutes and then asking to change to a different show over and over again. And don’t even get me started on how difficult trying to get him to clean up said toys was each night. So we decided something had to change. We decided to reclaim play. Screen Fast: The first and most radical step we took was to do a four-week screen fast. Due to the nature of our life in Guatemala, we relied on screens too heavily to entertain Auggie. He would have to come with us to every meeting, doctors appointment, and errand so we often let him watch one of our phones to pass the time. Additionally, we also fell into the trap of letting him spend most mornings in front of the TV during my pregnancy and Gideon’s early newborn days. We learned of a book called Reset Your Child’s Brain: A Four-Week Plan to End Meltdowns, Raise Grades, and Boost Social Skills by Reversing the Effects of Electronic Screen-Time by Victoria Dunckley, and Auggie was struggling with a lot of what the author claimed were symptoms of a screen time overload. So we decided to try it. Four weeks without screens was the goal, and we are still going strong five months later. It changed the culture of our home, making our home such a happy place that we never reintroduced them. Screens are now limited to sick days, family movie nights, and long car trips, leaving so much more time in our day for play. Evaluating the Toys in our Home: Our next step was basically to become toy snobs. I say that jokingly, but it is not far from the truth. We began to prioritize open-ended toys, and limit all others. I had a head start on this because I have always been annoyed by battery operated toys that sing and light up, but I began to be intentional about it. We started limiting toys to things that fostered imagination and open-ended play. 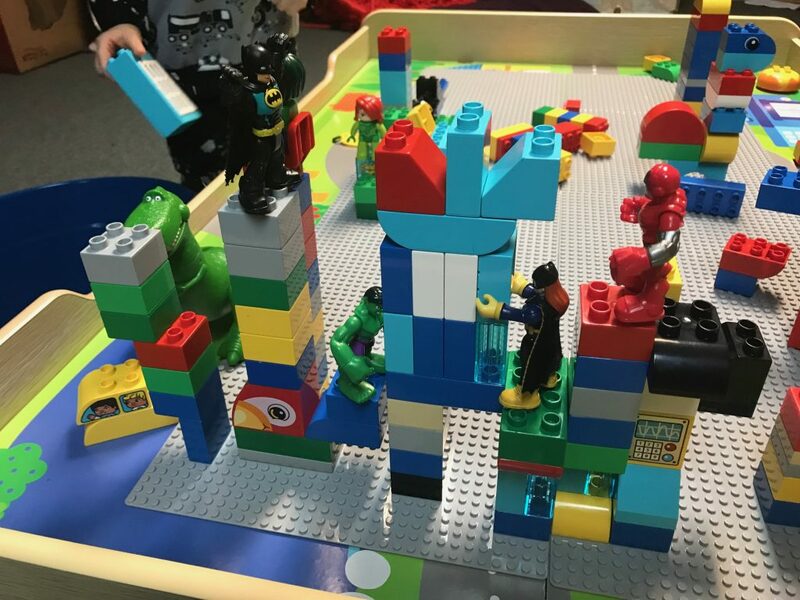 Some of our favorites became action figures, train tracks, tool and doctor sets, costumes, Duplos, cars, dinosaurs, and animals. In doing this, Auggie’s imagination exploded and we began to see healing in emotional areas that he struggled in from all of the transition. He began to sing on a daily basis, and find joy in the smallest things. Purging: The natural next step after evaluating toys in our home was to rid our home of anything that wasn’t open-ended. However, we didn’t stop there. We also got rid of anything that he didn’t play with as much as other toys, any duplicate toys (though we do have multiple Batman toys still because they are Daddy’s favorite), and anything that Auggie said he wanted to get rid of. I have also found that the key isn’t to just purge once but to keep the habit of purging on a regular basis. We have the unspoken rule that if either of us is overwhelmed by all of the toys, it is time for something to go. If I notice a pattern of him not playing well for a few days or refusing to clean up his toys because he is overwhelmed, we work together to find some things to get rid of. 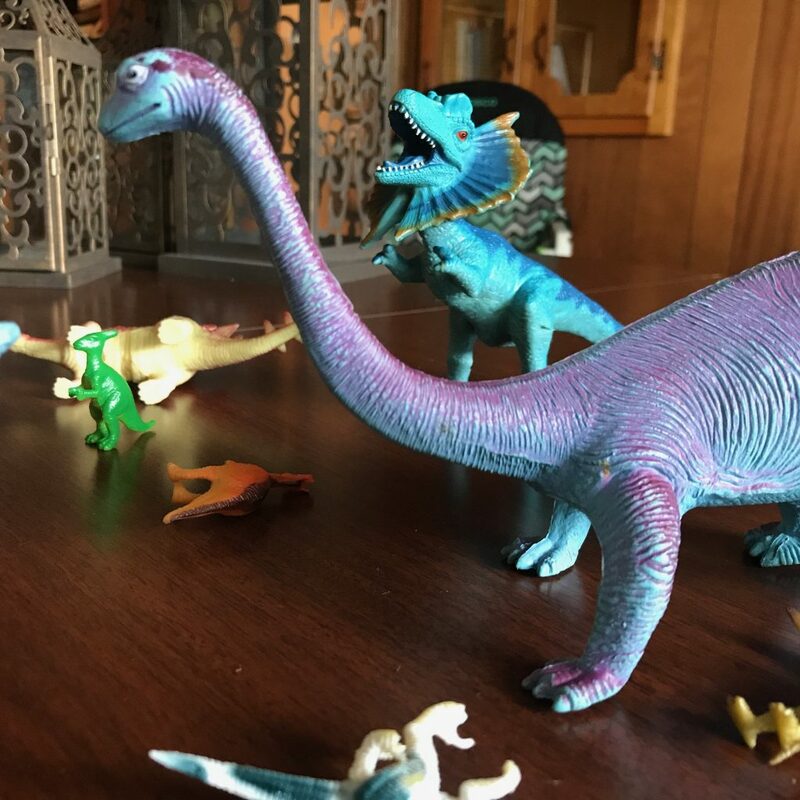 Other times, I find myself personally overwhelmed by all of the toys and purge on my own to get things back to a state where play does not become stressful for anyone and we aren’t a slave to the toys in our home. I have been amazed at how willing he has been to say, “I need to get rid of some things,” and follow through with it. Less really is more with toys. So often kids get too overwhelmed with stuff that they don’t know how to play, and it has been amazing to see that play our in our home. Creating a Space & Spot for Play: The final step has been a process but mastering it has been so freeing. We moved almost all of the boys’ toys out of the bedroom and to the basement “playroom” recently, and it has been a game changer. It has given them a space to imagine and play. After all, play is the work of childhood, so it has given them a place to do that work. Not only that, but it has freed their bedrooms up to be a place of peace for rest and reading. In addition to designating a space in our home for play, we have given each toy a home. 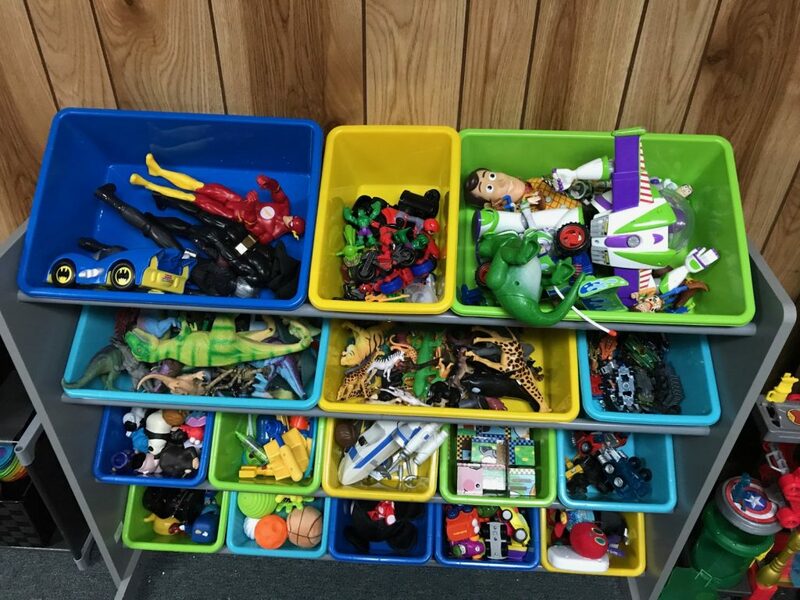 All toys are organized into bins that the boys can easily see and remove when they want to play with them. They can also help with clean up and return things to the spot that they belong. Albert Einstein once said, “Play is the highest form of research,” and I am so glad to see that happening in my home again. Few things break my heart more than seeing kids who don’t know how to play. Play is the work of childhood. It is also the joy of childhood. It is worth fighting for. I encourage you to put in the work to create a culture of play in your home because everyone in your home will benefit. 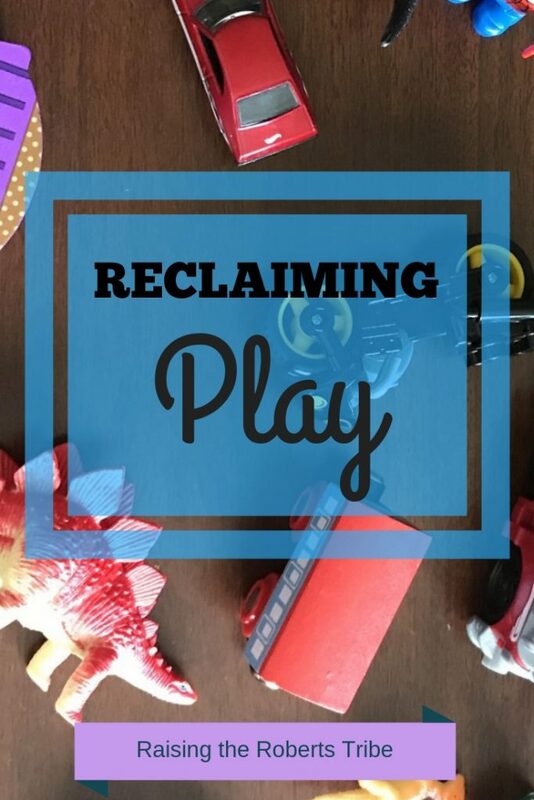 Let’s reclaim play.